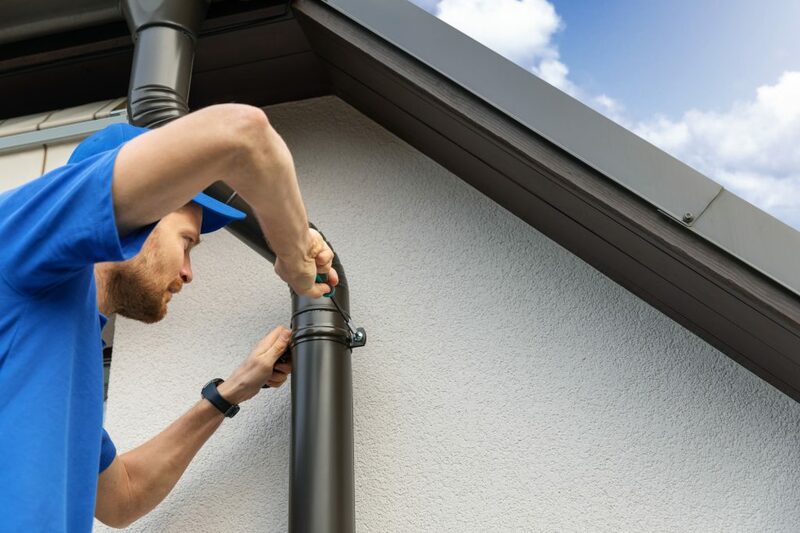 Because they do their job silently without fanfare, rain gutters are often a forgotten part of the house unless something goes wrong with them. And unfortunately when that happens it can be costly for you with all the water damage and repairs. Proper installation, maintenance and quality materials used all can play a big role in how your gutter system withstands the ravages of time and weather. Vinyl gutters have become one of the most popular types of gutters. Their benefits include the ease of installation and the fact that you never have to worry about them rusting. They are also a more economical choice. Because the pieces are lightweight and easily snap together, installation is also a lot easier making it easier for those homeowners who want to do the installation themselves. Another popular type of roof gutters, especially for residential gutters, is one made of aluminum. These like the vinyl ones are lightweight and rust-proof and if you are a DIYer, it won’t give you any particular headaches during the installation process. Other pluses with this type of gutters is that it, unlike vinyl, can withstand cold climates and can be painted whatever color will look best with the outside of your house. They also come in seamless models. You don’t see wood gutters a lot because they are more expensive, but architectural purists who are trying to restore an old home, will want them. Be careful though because not all wood gutter products are as effective at their job protecting your home from water damage. Copper gutters are also used in restoration projects. Although expensive, it has a lot of benefits. It doesn’t rust and never needs painting. Make sure to add a sealant though because copper will oxidize and turn green over time if not treated. Besides the material of the gutters, you need to decide between sectional versus seamless and K-Shape or Half-Round shape. Keep in mind that round downspouts today are only found on 19th century era houses and they must be one inch longer than the K-Shape to handle the same capacity. If you live in the western part of the United States, you will also have the option of Fascia gutters which are fixed to a fascia board. It can also be fixed to the end of rafters. For houses built in the 1960s, the gutters might be an integral gutter system which can hold more water, but on the downside are more prone to leaks. And if you prefer seamless gutters, you are going to have to go with an aluminum gutter system because that is the only type that currently offers a seamless option. In addition, when choosing the shape of the gutters, keep in mind that K-shape gutters carry more water and are more structurally sound than the half-round shape. With all these options, it can be a bit overwhelming. Remember though that the most important thing is that your home rain gutters does its job moving rainwater quickly and efficiently away from your home. The rest just comes down to the look you prefer and how much you can afford to spend. When the gutters can’t do their job, the water will damage the roof and come down the walls of your home, and mold can become a real health hazard. When gutters are clogged they also will start to sag and may pull away from the fascia causing even more damage. In addition, gutter systems endure a lot of wear and tear over the years so it is inevitable that leaks and holes will happen. If you are handy, a lot of this you can fix yourself. A leaky gutter joint can easily be sealed up with some caulk and small holes may only need some gutter sealant. For larger holes though you will need a gutter patching kit. And sometimes there can be problems right from the start when a gutter system is not built properly. If you try to install the gutters yourself and you don’t have a lot of experience or you hire a company that uses a lot of unskilled workers, you make be at risk for poor craftsmanship. Another installation mistake is when the downspouts are put too close the foundation of the house. When this happens the water will end up in your basement. If you don’t want to rip out the downspouts and redo everything, you can attach gutter extensions to the bottom of the downspout to redirect the water from the foundation of your home. One of the last things you will need to consider is whether you are going to have them professionally installed or to do it yourself. If money is a worry, you can definitely save by installing the system yourself, but you need to make sure you know exactly what you are doing and that you are following safety protocols. Regular maintenance is also important for the health of your gutter system. The SpoutOff system can also help reduce leaks. TheSpoutoff outlets are designed with a larger opening allowing for water to still run down even if other parts of the gutter are clogged. For more information, call The SpoutOff today.